Cacti have evolved in the desert environments of the Americas to become an important source of food and shelter for many different species. Of the 141 species of cacti on the IUCN Red List, 25 species are classified as Endangered and 27 are Critically Endangered. Some cactus species live up to 300 years. The tallest Saguaro cactus was 17.64 metres. Did you find what you were looking for in this page? Cacti are unusual and distinctive plants superbly adapted to the arid conditions in which they thrive. Native to the Americas, many species of cactus are now endangered and vulnerable to extinction. With some species reaching over 10m in height, the cactus defines many of the landscapes in which it lives. Cacti have developed spines which allow less water to evaporate through transpiration by shading the plant, and defend the cactus against water-seeking animals. Most cacti have very shallow roots that can spread out widely close to the surface of the ground to collect water, an adaptation to infrequent rains. Humans have used cacti since the time of the Aztecs, and they are used by North American Indians for religious ceremonies. Today they are used as food (jam, fruit, vegetables) and are a host for the cochineal insect, from which a red dye (carmine) is obtained. For many animals such as the bighorn sheep and the antelope ground squirrel, cactus are an important source of food and water. The cactus wren and California thrasher often build their nests in the buckhorn cholla. The gila woodpeckers and gilded flickers chop burros in the long arms of the Saguaro Cactus. What are the main threats to cacti? The key threats to cacti are illegal seed and plant collection and habitat loss. Some species have been so extensively collected the population size has reduced by as much as 95% over the course of 25 years. As a result, there are as few as 50 plants surviving in certain species. Whilst all cacti species are covered by CITES, additional controls are needed, particularly in importing countries. Habitat loss due to road construction, mining for quartz or charcoal, deforestation and the resulting erosion also threatens many cacti species. As a result, some species are restricted to an area as small as 1km2. A more recent threat is climate change, which impacts on other species such as monarch butterflies which pollinate cacti species; and poses a threat to some cactus species through rising sea levels. 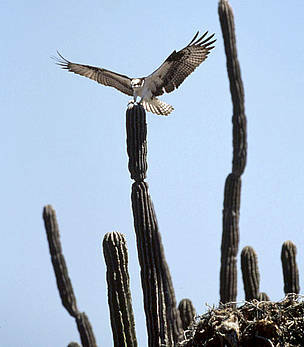 An osprey (Pandion haliaetus) lands on a cactus next to its nest on Tiburón Island, Sonora, Gulf of California, Mexico. Cacti are a WWF priority species. WWF treats priority species as one of the most ecologically, economically and/or culturally important species on our planet. And so we are working to ensure such species can live and thrive in their natural habitats. 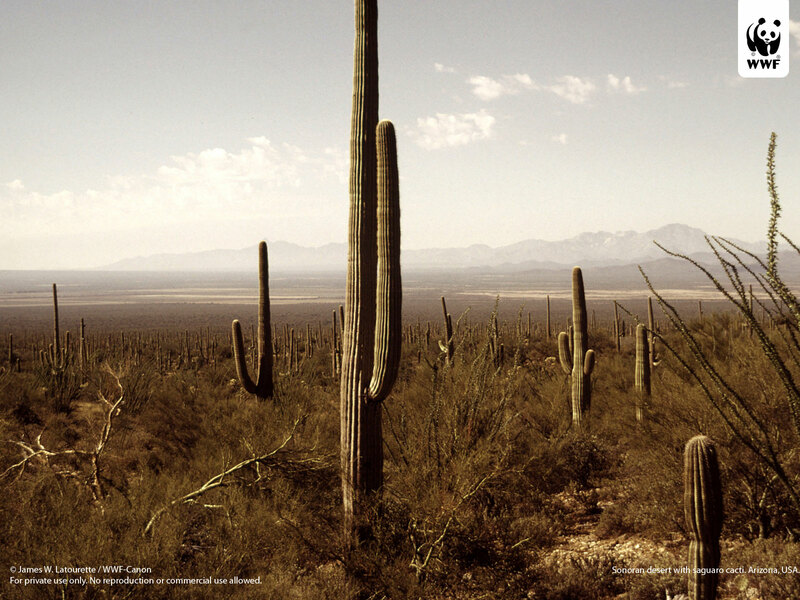 WWF aims to protect areas where cacti grows. It works with local governments and authorities to push for protected areas. WWF also supports the monitoring of trade in cacti plants and seeds to address the main threat to the survival of many of these species. Through its work with TRAFFIC, it aims to ensure there are proper controls in place to prevent illegal collection and trade in cacti. Establishing TRAFFIC presence in Mexico. Many cactus species are night blooming, as they are pollinated by nocturnal insects or small animals like moths and bats. 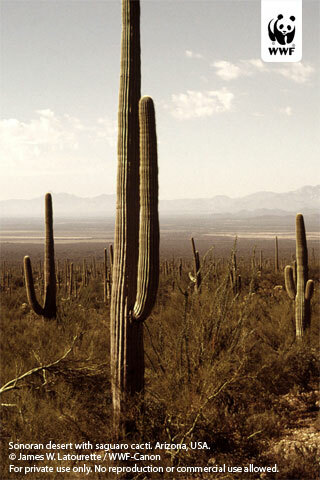 A fully grown saguaro cactus can hold as much as 760 litres of water. In 1997 a devestating freeze on Mexico's Altiplano reduced some cacti populations by as much as 95%.